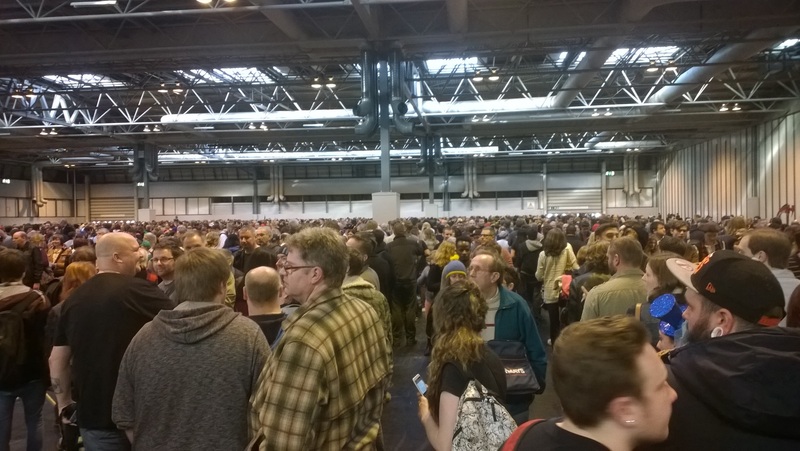 Costuming the Fandom: The Cosplay of MCM Expo Birmingham 2014. 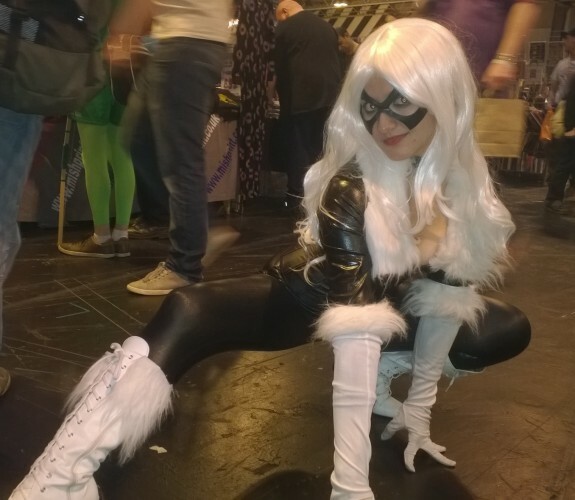 Birmingham Comic Con is quite probably the largest UK comic convention outside of London, with nearly a hundred guests and thousands of attendees throughout the weekend. Even before entering the convention, attendees soon realised that Birmingham Comic Con was something special, due to the dozens of cosplayers encountered in the Atrium, which was also patrolled by the UK Garrison’s classic storm troopers. However, it was shortly after entering the convention itself then the true breadth of geek culture’s popularity was fully realised. One hall had been set aside purely for people to buy tickets on the day. However, the queues filled the hall. This did not take into account the number of people who had bought tickets in advance. Yet even with nearly two hours wait to buy tickets, this does not beat the queue to enter EM-Con earlier this year. Rule #1 Always buy your ticket in advance. Always. The second thing that will be noticed upon entering Birmingham Comic Con is that it is big, I mean very big. Three halls connected together to form a single giant cornucopia of science-fiction and fantasy, to create a smorgasbord of geekery. It could be quite overwhelming entering a convention for the first time if you are unprepared. It was easy to spot those who had never visited a convention before, as they could be seen standing awestruck at the thousands of people exploring the hundreds of stalls with dozens of cosplayers amongst them. Rule #2 Download a convention map and schedule so not to miss anything. The biggest draw for Birmingham Comic Con was the guest-signings, with many of the stars from Red Dwarf, including Chris Barrie and Robert Llelwyn (Craig Charles was stranded in some jungle apparently). However, for some the biggest draw was the chance to meet actors from classic television comedies, such as Kim Hartwell who played Private Helga in Allo Allo. Relic Hunter actor Christien Anholt was one of the many actors that who a signing table, during which he revealed an interesting nugget that there were “discussions of a sequel” for the cult rom-com movie Preaching to the Perverted, which he had starred in opposite Guinevere Turner. Rule #3 Expect to queue. You will always queue. This was the queue just to buy tickets! Conventions often differ from the usual memorabilia exhibitions, in that the stall-holders are often just as much fans as the attendees themselves. Birmingham Comic Con was no exception, with many of the stall holders wearing various costumes, such as the excellent Snikt and Bamf, which added to the fun atmosphere for the day. It would be very easy to empty your bank account – and overdraft – at a convention, and Birmingham Comic Con was all the more so, with everything from comic books to film memorabilia on offer. Whilst many stands accepted cards, some did not and the guest signings and food huts only accepted cash. ATMs were available, but only for a significant fee. And another queue. Rule #4 Bring money with you. However, despite the temptation to spend all your money, it is not a necessity. A lot of the fun in attending a convention is gained just from wandering the stands, meeting your favourite actors and viewing the displays, as well as admiring some of the awesome costumes being worn. Costumers, or more accurately cosplayers, are to conventions what bees are to honey, and are what makes conventions have such a carnivalesque atmosphere. Cosplayers can be anything from the casual fan dressing as their favourite character to the dedicated professional groups. Birmingham Comic Con was no exception to this, with some great costumes being worn, in particular the squad of Colonial Marines from Aliens and Lady Deadpool. All of the cosplayers were friendly with strangers asking to take their photos (or often have their photos taken with them). Birmingham Comic Con was just as much a family-day-out as it was a convention, as dozens of families with children were there, many of them dressed as their favourite characters such as Iron Man and Thor. However, due to some of the more scary costumes (such as the hulking Space Marine from Warhammer 40,000 or the Xenomorph from the Alien movies), it may be unsuitable for more timid children. Overall, Birmingham Comic Con was a prime example of a convention managed correctly. The queue for day-tickets was unfortunate, and could have been alleviated with more ticket booths, but the people arriving without tickets were equally to blame.